Gum recession is the process in which the gum tissue recedes and exposes the roots of the teeth. When this process occurs pockets can develop between the teeth and the gum line. Bacteria can easily build up within these pockets and if left untreated, the presence of bacteria can cause serious damage to the surrounding gum tissue and bone, and at its worse it can result in the loss of multiple teeth. Gum recession can often be found in dental patients that have poor oral hygiene and in patients who have periodontal disease. However, it is also possible to see gum recession in dental patients who have good dental hygiene. In some cases, gum recession can simply be linked to your genetics and numerous studies have demonstrated that around 30% of the population may be predisposed to gum disease (which leads to gum recession), regardless of how well they care for their teeth. Gum recession is usually a very gradual process but it will impact the appearance of the teeth and gums and can leave people extremely self conscious and fearing tooth loss. It can also lead to tooth sensitivity due to the process of the roots of the teeth becoming exposed. If you suspect that you have gum recession, it is important that you seek advice from a dentist. If you are regularly attending your dentist, they should also be identifying your gum recession and diagnosing the cause for this recession. Most cases of mild gum recession do not need treatment. It is quite often the case that dental practitioners may just be able to provide advice about preventing further recession. Quite often, it is also important for dental practitioner to teach patients how to brush their teeth gently, yet effectively. In some cases, the cause of gum recession is identified as periodontal disease and further treatment is needed to remove harmful bacteria from around the pockets, which have formed around the receded gums. In those cases, it is critical that your dentist provides you will oral hygiene instructions and that an exemplary oral hygiene routine is adopted, to prevent further recession. 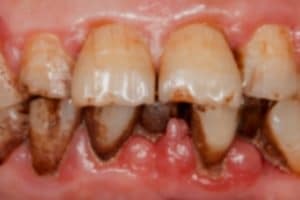 Unfortunately, as specialist Dental Negligence Lawyers we are often instructed to act for clients, where their dentist has failed to identify that the cause of the gum recession is periodontal disease. If you have been diagnosed with gum/periodontal disease which you think your dentist should have diagnosed earlier, you may have a claim for Dental Negligence and it is important to seek specialist advice to ensure your treatment is fully investigated and compensation achieved for your future treatment requirements.